Posey Transfer Belt and Posey Deluxe Transfer Belt with handles provide caregivers with added control and peace of mind while transferring patients. 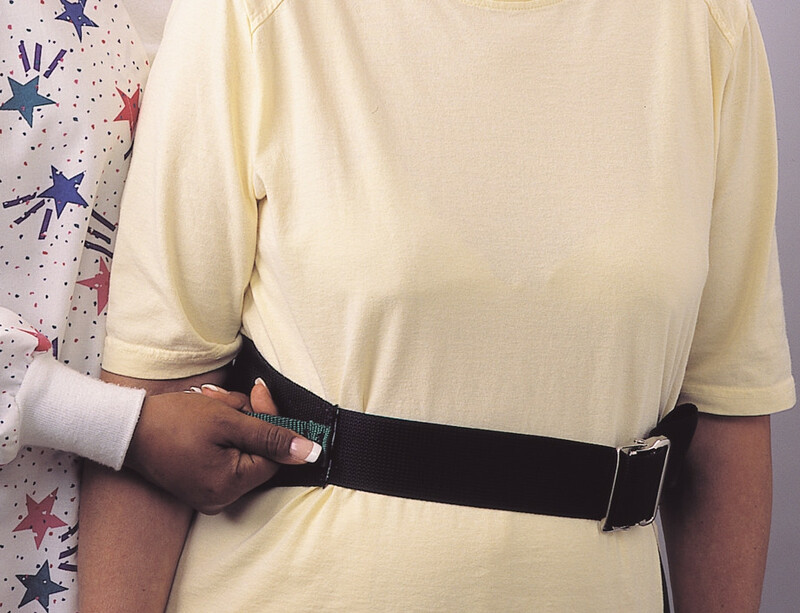 The belt is designed to save needless back strain and injury to the caregiver. There's no need to ask for additional help, the transfer belt's design will allow for a single individual to lift a heavy person. The colored vertical and horizontal grab handles, with secure stitching, give the caregiver a variety of holding positions for maximum stability and firm grip. The transfer belts come with either the nickel-plated buckle or the Quick-Release buckle option that's very helpful for fast fastening and unfastening. This is a great option for full transfers to and from the wheelchair, the toilet or bed. It also gives the patient assurance they're in good hands. 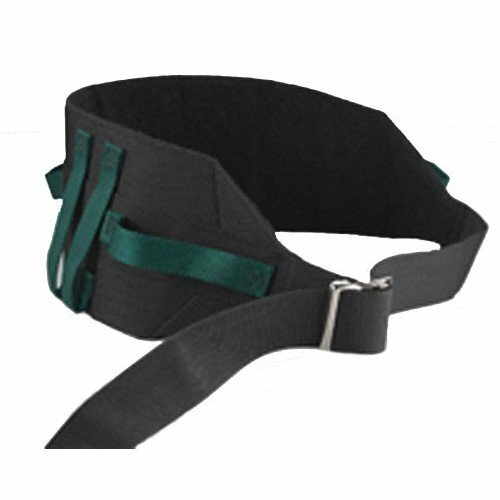 The Posey transfer belt is designed to aid as a walking belt as well and give mobility with stabilized walk support. Ambulatory patients receive steadiness while walking or going up and down the stairs. Posey Transfer Belts have durable nylon webbing construction making it machine washable. Its wider design offers comfortable back support with the 4 or 6-Inch wide band which also minimizes chaffing. The belt is easy to use and easy to adjust to the user. Center the belt around the patient's waist with buckle in the center front and the rear adjustment strap at the top of the belt. Adjust the belt for a snug fit but not uncomfortable for the patient. Secure belt with the metal buckle or insert end into the Quick-Release Buckle. Tighten the straps so they lie flat. Make sure you can slide your open hand (flat) between the belt and the patient. Always grasp the transfer belt from underneath. Assist patient using your facility’s approved procedures. Do not release buckle during transfer as it may result in injury. ALWAYS verify the buckle is not broken or cracked and holds securely before transferring the patient. Shipping price? Also, does $24.99 have plastic buckle? I would want metal. Thank you for info. Shipping prices vary based on total amount of each transaction. The specifications for the belt state the buckle is nickel plated. caregiver. Very happy with this product. This belt is perfect for assisting my husband to stand from a seated position as it supports his lower back, keeping him in good alignment. I find that I use it every time he ambulates without a walker because it gives me something to grab if he needs to be steadied. It's easy to get on and off and is comfortable for him to wear. It's easy to adjust as well. All gait belts will ride up due to clothing riding up, but this one is comfortable and secure when assisting him. great item. works wonderful on my father. this belt does not hurt him like the one the hospital gave him, would reccomend 2 any one. We've tried the standard, narrow "gait belts", but this transfer belt is in a class of its own. All belts will ride up a bit, but the 6" width spreads the pressure across a larger area and prevents the belt from cutting into my Dad too much. The multiple handles make transfers from different sides/angles so much easier and safer, as well as allowing a second person to help in trickier situations like getting into a car, etc. Love the quick release "buckle", too, making it very easy to get off and on. The Posey Gait Belt with the 6 loops is an amazing product that is used my consumers. I only returned one because I had ordered 2 and received three, and didn't have a need for the 3rd one. Be for purchasing read a review that when in use the belt ride up. I have found this a big problem it doesn't matter how tight you have it around your waist it rides up I'm disappointed in it. This belt goes on and off easily with the quick release and once fitted to the correct length. Loop handles are well placed and make transfers easier and more secure which is important for my Mom who often fears falling during transfer. I have been using a gate belt like this for 3 years, but due to the cracking of the plastic clip, I had to get a new one. With the handles the caregiver had total control of the patient. The best gate belt I have ever used. My husband is not heavy, but when he fell in the past, I had a very difficult time getting him up off the floor. This transfer belt is so easy, and I am able to lift him up immediately.